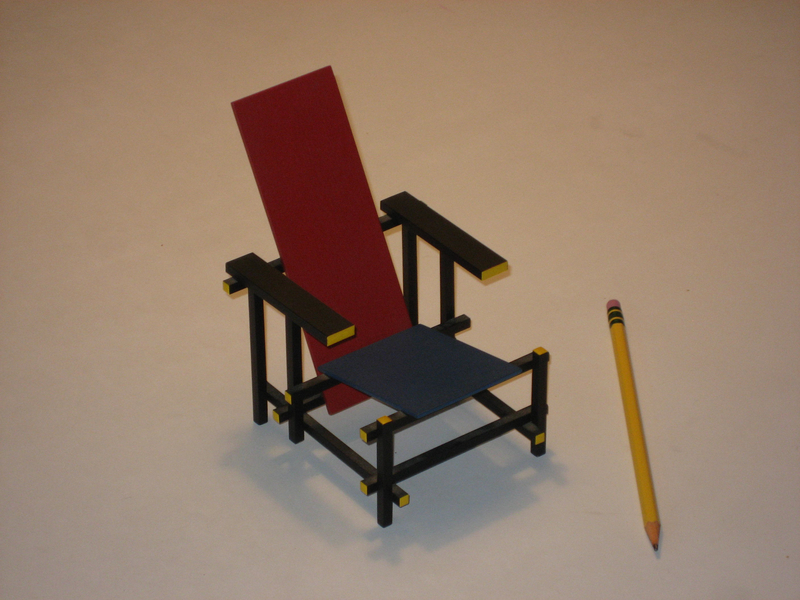 Jim Holt, philosopher, on his miniature replica of the Rietveld chair. GB Tell me why you chose your chair. JH I have the aesthetic of a mathematician, even though I’m a failed mathematician myself. So what appeals to me about the Rietveld chair is the abstraction, the universality of the rectilinear form and the simplicity. That’s my simple-minded notion of beauty. Messier forms of beauty disturb me and elude me, like the beauty of a Shakespeare play. It eludes my best self. I like the fact that Rietveld was part of De Stijl, one of the first abstract movements in art. I like the domestic scale of his chair at a time when the Russians were making quarter mile high, imposing abstractions. This is an almost cosy abstraction. And I can’t afford an original but even the replica is over $250 dollars. I like the fact that it goes from abstraction to usefulness as a thing to be sat on and back to abstraction again as a miniature. GB It’s interesting that they were looking for universality but now the chair seems so much a product of its time. JH Yes. They were trying to escape the lyrical and ended up creating very lyrical things in spite of themselves. Of course De Stijl and Rietveld in particular were absolutely wed to the idea of rectilinearity. When Van Doesburg decided to use 45-degree angles it produced such a quarrel with Mondrian that he left the movement. They took themselves very seriously. Rietveld himself didn’t like symmetry but in the case of the chair the symmetry was imposed on him by the bilateral symmetry of the human body. It’s a lovely mixture of abstraction and friendliness to imperfect biological humans. I remember that Tom Ford wanted a Rietveld chair when he was in his twenties. He ordered a kit and built one himself in his apartment on 2nd Avenue. So I got to sit in it and they’re remarkably comfortable. The De Stijl members actually thought that these abstract forms they were creating were mirroring a kind of neo-Platonic reality that was unseen. They were all mad theosophists. On one hand, I’m instinctively anti-mystical but on the other hand I like Platonism because when I was doing mathematics I felt like I was involved with this Platonic reality of perfect mathematical entities that transcended the empirical world. All mathematicians are in the grip of this Platonic romance and I like the act that the De Stijl artists were in the grip of a similar if slightly woollier romance. GB In your book, Why Does The World Exist?, you refer a lot to the beauty of mathematics. JH Yes, beauty and the notion of simplicity. When physicists are groping for a theory and they don’t have any decent data, a notion of simplicity will often guide them to the right theory in advance of the data. GB So do you think beauty can help guide us towards the answer to why the world exists? JH Oh I wish that were true! I think the universe is more ugly than it is beautiful. I use this slightly tongue in cheek proof that reality at a general level takes a logically unique form. Ironically this proof begins with principles of simplicity and fullness. Simplicity being a bedrock principle of science, that you always reach for the most simple explanation and the principle of fullness being a traditional philosophical principle that goes back to Plato. Beginning with these and going through a few twists of logic I end up with the conclusion that the form we can expect reality to take at its most general level is that of an infinite, incomplete mediocre mess. The laws of physics are not particularly elegant. The ingredients of the universe show no aesthetic parsimony. There are 60 odd elementary particles. That’s way more than is necessary. If the universe is created by a God it’s a God with no sense of economy or elegance. There’s way too much suffering in the universe. Childhood cancer shouldn’t be a part of any decent universe. And even though it’s infinitely removed from nothingness the universe also falls infinitely short of containing all imaginable realities. GB A few people have quoted an artist called Agnes Martin to me who says that beauty is ‘the mystery of life.’ Do you think if we solve the mystery of everything you’ll still see beauty in the same way? JH No I think the delight one experiences in grasping a truth is the same sort of delight that’s elicited by beauty. I hate to make the hoary old distinction between the beautiful and the sublime but I think that things that are deeply mysterious don’t appeal to me. I’m irritated by mystery. It’s a temperamental thing. I know some people love it. So the day is beautiful and the night is sublime, as Kant said fatuously in one of his early works. The day is flooded with sunlight and everything is crisp and clear in its contours whereas the night is obscurity with these pinpricks of light that are stars. In the extremely unlikely event that all cosmic mystery is somehow dissolved, I don’t think that will destroy my aesthetic appreciation of the cosmos, but then I don’t think the cosmos is an aesthetically satisfying object as a whole. It’s a botched job! I think we should send it back and get a new one! JH I tend to see beauty in simplicity and symmetry. I like rectilinear forms that can be captured by equations that I understand. I know that the highest beauty would be in something like King Lear and I can dimly grasp that but if I were the emperor of the world there would be no buildings by Zaha Hadid. It would always be obvious where the entrance to a building was because it would be symmetrically located. I’d banish Frank Gehry to the ninth circle of hell. I would probably have all the impressionist canvases burned! It’s a form of higher philistinism. I wish I weren’t like that but it’s the mixture of genes I got and people who are attracted to the mysterious and the sublime and the messy and the complicated have a more interesting sense of beauty than I do. But you work with what you’re given. GB Are you very tidy? JH I’m messily tidy but since I don’t really consider my physical environment to be real it can be untidy. There’s an Isaiah Berlin essay on the hedgehog and the fox where the fox knows many things and the hedgehog know one big thing. He divides the great creative figures into those two categories so for him Dante is a hedgehog and Shakespeare is a fox. It was mainly about Tolstoy who was a fox who wanted to be a hedgehog. I’m a hedgehog who admires foxes. I believe one big thing, which is the conjunction of the axioms of set theory. So my intellectual life is very tidy while my personal life is squalid in the extreme! I much admire this article. But it occurs to me that if we always reach for simplicity, we will end up with a simple-minded and often cruel socieity. Shakespeare, and appreciation of the detailedness and unsimpleness of many of the world views of different cultlures, all these will and are dissappearing. And into simplicity we have snuck statistics, to cover the gap. Beauty but danger.